On January 1st, Hull City of Culture opened with a firework display over the Humber and some incredible projection works throughout the city, such as Made in Hull by Zsolt Balogh, which illuminated the facades of Queen Victoria Square. Another projection work, (In) Dignity of Labour by Make Amplify, was not only technically brilliant, but its choreographed story of unemployment and life within the benefit system had a poignant, human message. If the political turbulence of the new year continues, 2017 will be the year in which nations throughout the world will have to fight for humanist agendas and bring their fight directly to the political and capitalist infrastructures that are determined to act upon their own word and not that of the people. The decisions we make as a county over the next 12 months will ultimately affect the individual, not just the population’s median, and it’s important that cultural and artistic works such as (In) Dignity of Labour are capable of reminding the individual of their own power and importance when it comes to deciding the fate of their nation. While the specifics of Brexit remain un-drafted and obscure, the seemingly inexorable division of nations, classes, races, sexes and politics becomes evermore noticeable as our leaders chose to side with anti-humanitarian politics that masquerade as issues of national security, and contradictory messages run rife throughout mainstream and social media. As the morals of politicians and capitalist libertarians deteriorate before our eyes in their pursuit of continuing political and capitalist power, it is more important than ever that the world’s cultural ambassadors use their art to address inequality, illicit politics, and outright bigotry, sexism and elitism. While there is something to be said for the escapism offered by art, now is not the time to lose ourselves in fabrication, but to keep our focus on those who would decide our fate without our consent. More importantly, whatever decisions are made and whatever sides are chosen by friends, family and fellow humans, we cannot let our differences of opinion lead to the isolation of the individual. The power of the people is latent within the collective and if we allow media, politics or ideology to isolate us from one another, then the power and control we have over our own lives is lost to bureaucracy, shadow law and the 1%. This talk by Rob Willer is a reminder of the importance of empathy in our discourse and is more relevant than ever as relationships are tested by the political ideology that is at the forefront of our daily lives. 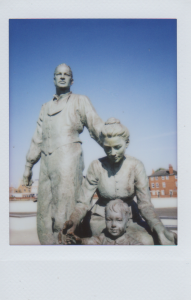 Also, a walk to the end of the Hull marina to see the sculpture Pioneers by Neil Hadlock (depicted in the photograph above) is a worthwhile venture at this time: it is dedicated to the 2,200,00 people that passed through Hull and the Humber ports on their way to American between 1836 and 1914.